Here's what others have had to say about Saddlebrook Resort and Saddlebrook Tennis (Hopman). 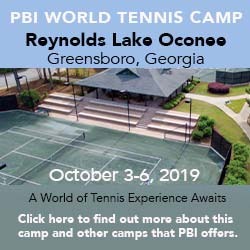 The room rates quoted below are special discounts for those who also enroll in a Saddlebrook International Tennis Academy (at least one guest must be taking the tennis-instruction series). By booking tennis and lodging together, you get a deluxe guest room, 5 hours/day of intensive tennis, complimentary court time, daily lunch, and access to the fitness center and spa. One- and two-bedroom suites with full kitchens are also available (call for rates). Mention Tennis Resorts Online when you book and you'll receive an upgrade to a one-bedroom suite (subject to availability) and a complimentary Saddlebrook Amenity Basket. Other packages and room rates are available. Book a Saddlebrook Adult Tennis Camp, which offers five hours a day of instruction, and a regular deluxe guest room at Saddlebrook Resort and they'll upgrade you to a one-bedroom suite (provided one is available at check in) at no extra cost (two-night minimum) and include a complimentary Saddlebrook Amenity basket. To get it, phone toll-free 800-729-8383, x4200 and ask for the Tennis Resorts Online Upgrade.